Troggg or Moss (with Brett) wandering around the party entertaining guests (no puppet stage set up). Humour and content will vary depending on audience at any given section of the event. There’s much improvisation and ‘in the moment’ conversation between the puppet character and the guests. And in a normal, corporate workplace situation, roving puppetry could really boost employee morale in the office. 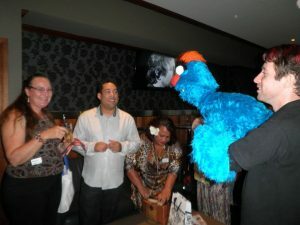 Roving puppeteer, entertaining guests or team members for 1 hour or more. The initial 50% deposit to lock in the booking is $45. And then the remaining $45 (if the booking is only for an hour) can be paid in cash on the day of the event, or via direct deposit. Details of Payment Methods here.